All images courtesy of SOHO. Although we are nearly at solar minimum, the Sun keeps surprising us with strong flares and auroral events. Sunspot group 792, an active group that blasted our world with unseasonable flares and produced unexpected aurora, has survived its passage around the Sun and is back on our side again. It's bee blasting out a series of flares. The latest one an X 1.3 giant. The image below is of an earlier M class flare (the most recent data isn't up yet). A movie of the flare is here (WARNING 4 meg file). These flares are of interest because they produce disruption to communication services and satellites (a particularly violent one broke the Japanese Mars probe) and they produce aurora. Aurora are particularly beautiful in the southern and northern reaches of the world, but even here in South Australia strong storms can be seen as a reddish glow moving restlessly in the sky. Will this latest flare produce aurora, we don't know, but if it was Earth directed, it is a good bet. I will keep you posted. The Bad Astronomer reports another big TNO has been found, possibly bigger than the one I just reported on. A report is at the Sky&Telescope site. 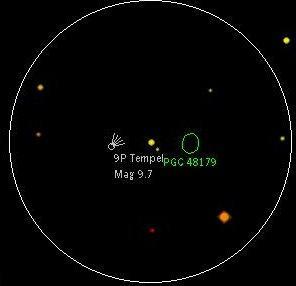 A new transneptunian object (TNO) has been discovered. 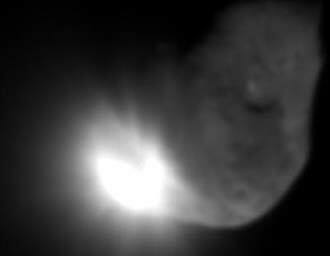 Big TNO's have been found before, like Sedna (named after an Innuit Goddess). But this one looks as if it is as big as Pluto, if not bigger! Of course, this depends on its reflectivity. If it has the same reflectivity as the other TNO's then it is about twice Pluto's size. 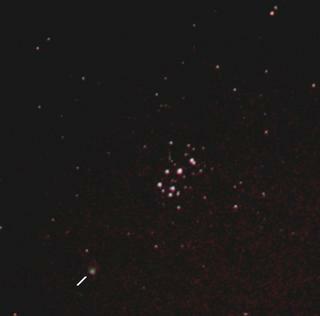 It has already been picked up by amateurs (with a 30 cm telescope though). It's orbit appears to be inclined 28 degrees to the Solar plane, even more eccentric than Pluto, at 17 degrees. It is also 51 AU away (Pluto is on average 39 AU from the Sun). Shock! 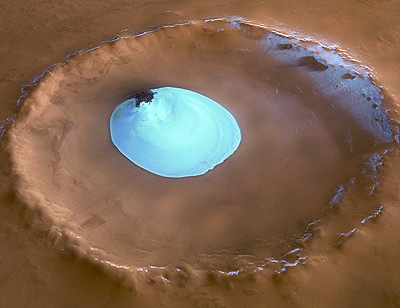 Water found on Mars!! The exciting experiment is MARIS, which will search for buried water ice at lower latitudes. MARIS has been successfully deployed, and is currently searching Mars for subsurface water. Especially the smooth northern plains, may have once contained large amounts of water. However, it will take some time to accumulate enough data to interpret the signals they are receiving. A newspaper in Canda has reported a meteor hitting a tractor. husband's Montney ranch, just north of Fort St. John. Well, that's one way to get out of working. Many alleged meteor strikes turn out to be something else entirely, but preliminary investigation suggests this is the real deal. Looks like the Shuttle is safe. The shuttle Discovery successfully docked with the International Space Station. It looks like the shuttle right wing was struck by falling debris. However, preliminary investigation suggests that the shuttle is Okay, but it will be another 3 days before engineers will be confident of the Shuttles status. You can see a great video of the Shuttle doing its orbital flip here. This was so the ISS team could inspect the underside. NASA is currently doing some soul searching, and the shuttle fleet remains grounded, but things are looking much better for Discovery, and normal misions, including attaching the cargo transfer module, are going ahead. As I write, NASA engineers are minutely scrutinizing images of the Shuttle for signs of serious damage, and the shuttle fleet is grounded. As you may know, debris was seen falling from the external fuel tanks, just like the debris that hit and damage Columbia, leading to its tragic loss. As yet there is no evidence that the debris has caused any damage, but it will be a while before they are sure the Shuttle is safe. Poignantly, the man charged with determining if there is damage is astronaut Andy Thomas, who shares his name with Smallest One. Australia is probably watching this mission more closely than most, as Andy is our astronaut. We are innordinately proud of our Andy (the newspapers carried a story today, "Cool stuff Andy will do in Space"). Not only Australian, he's South Australian as well. This is fitting, as South Australia was the site of Australia's space program (or rather, Mother Englands space program, carried out on Australian soil). When I was young, I thrilled to the launch of rockets from Woomera, and wanted to work there exploring space. The space programs closed long ago. Woomera now houses a refugee dentention centre. Not far from my house is the Aerospace museum, which is a large shed holding sundry planes, plane parts and fragments of the rockets Woomera used to launch into space and my imagination. I go there occasionally and silently commune with their shells while the boys race around the Cessnas. NASA is relentlessly upbeat about it all. But the accident represents a substantial setback, to have the same type of failure as Columbia on your first launch is not a good sign. The hope that Hubble might be saved is fast receeding. Fortunately, the shuttle is docked with the ISS, so if there is a problem the astronauts can wait until a Soyuz spacecraft picks them up. With this setback to the shuttle fleet, and the relentless siphoning of funds form basic science to the Moon and Mars missions, space science may be also setback substantially. And Astronaut Andy, staring at pictures of Discovery, like me in that big shed at Port Adelaide, may be looking at a museum piece. I've been busy with beginning of Semester stuff and a few deadlines, so the blog has been quiet. But thanks to Stuart I've been introduced to a new toy. It's a photorealistic planetarium program called Stellarium. A screen shot is reproduced here. It is gorgeous, it is wonderful it gives wonderful sky views and best of all it is FREE!!! But, and there always is a but isn't there, it is painfully S L O O O W. It is glacial. This is probably due to all the photorealistc rendering they do. My favorite CPU hog, the 3D spaceflight simulator Celestia (run, don't walk, to this site NOW) is positively zippy by comparison. When these guys say you need a fast CPU, they are not kidding. Even setting the time in the program is a series of painful waits (it is almost, but not quite, worth the effort to set up scripts to turn Celestia into a planetarium program). So I won't be giving up SkyMap any time soon, if you want a free Sky Charting program for astronomical observation, then try Cartes du Ciel. But if I want to impress visitors with demonstrations of the sky, or generate photorealistic horizons for my web page, then Stellarium is it. 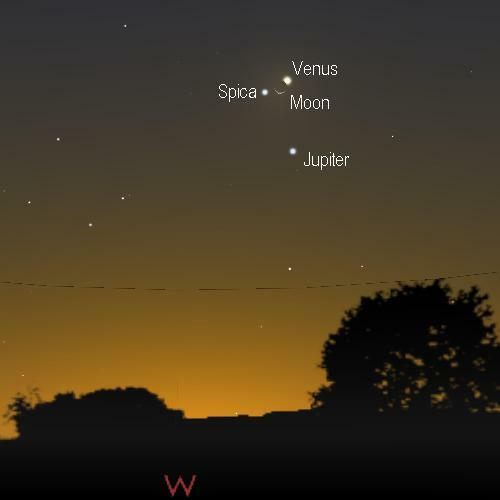 If you look to the west shortly after sunset, you will see bright Venus blazing out. 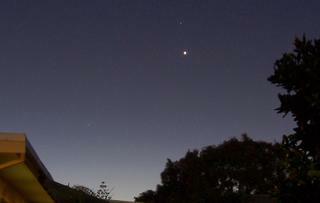 As twilight deepens a bright star gradually appears above it. This is Regulus, the brightest star in Leo, the Lion. 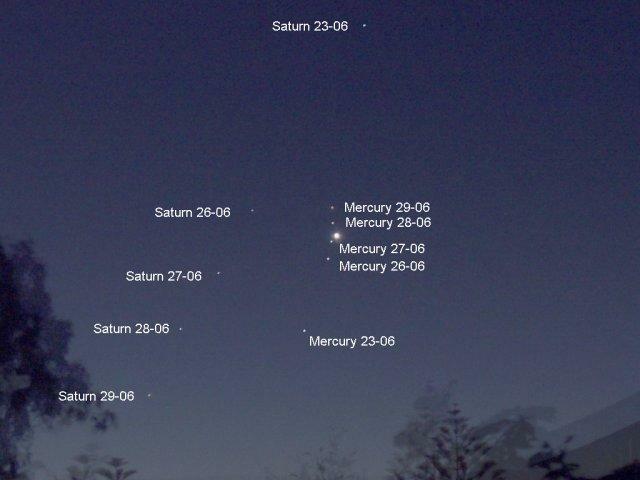 This Saturday (23 July), Venus and Regulus will be just a fingerwidth apart. Not as spectacular as Venus and Mercury a little while back, but not bad at all. In the picture, Venus is the brightest dot, the one just above it is Regulus and the brightish dot down near the roof tops is Mercury. Click on the image for a larger picture. Today is the 36th Anniversary of the first Lunar landing. Run don't walk, to the Google Moon site, to check out the Lunat landing sites. (A bit tip of the hat to Stuart at Astronomy Blog for the heads up). Picking fragrant herbs in the evening, anise Basil, parsley. Smallest One holds the torch so I can see amongst the crowded fronds by its wobbly light. Above, the smiling, rising Moon silvers the roof tops on one hand, while on the other, Mercury, Venus and Spica shine out in a cluster. The smell of aniseed fills the air. This morning I got up in the wee hours before astronomical twilight to try and image Mars. After some frustration, until I discovered I had knocked the finderscope out of alignment (especially since my south-pole aligned scope required me to govel in the dirt to see Mars through the finderscope), I finally got Mars in the camrea filed of view and took some shots, the best of which you can see above. As you can see "best" is a misnomer. Seeing was terrible. It was bloody cold but the turbulence was terrible, the limiting magnitude was pretty low too. Probably because the sky was full of failed mist, which insisted on condensing on the telescope and me. Anyway, my first Mars shot. I have put an image from the JPL Solar System Simulator site for comparison. You can clearly see the dark markings in my awful image correspond to those from the expected face of Mars (Mare Siremun I think). I was surprised to not see a polar cap. When I observed Mars at similar stages before opposition in 2001 and 2003 I could clearly see a polar cap. 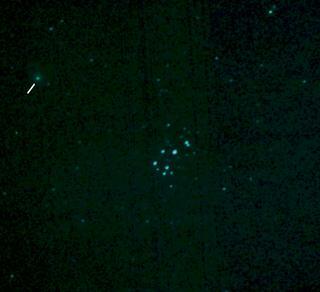 The two dots down below are my first shots of the Pleiades. The Pleiades are too big to image with my camera, but it means I can go after more compact obects of similar brightness. Finally, after a beautiful cloudless day the evening sky was clear and the ground was dry enough for me to wheel out the telescope and computer. I set everything up, and got a nice image of gibbous Venus (middle image). Then I turned to Mercury, which was now covered in cloud. I did an image of Jupiter while waiting for the cloud to break (you can barely see Calisto in this version, but Europa and Ganymeade are visible on the original image Io is transiting Jupiter and is too dim to be seen against Jupiter). I finally got an image of Mercury (top image), but it was very close to the horizon, and turbulence was severe. You can almost see a cresent, if you squint. I wanted to image the shadow transit of Io, but of course Jupiter disappeared under a thick layer of cloud before the transit began. Typical. Back in the 90's, astronomers thought they had a good idea of how planets formed. Planetary composition largely depended on the temperature of the disk of dust and gas where they started condensing. Close to the sun, where it was warm, planets would be rocky, further out, they would be icy. Gas giants could only form in the cold reaches of the protostellar disk where they could accumulate sufficient mass to hang onto massive amounts of gas. Reasonably sophisticated computer simulations based on these principles (well it is a bit more complicated than that really) produced solar systems similar to ours, rocky planets close, gas giants and icy world further out. Then the first exoplanets were found. Massive, super Jovians screaming around their suns in orbits closer than Mercury's. These "hot Jupiters" destroyed our models. We've found solar system-like worlds recently, but the hot Jupiters need to be explained. Currently the best bet is that these planets form further out, then migrate in (incidentally ejecting or absorbing any terrestrial style planets in the way). One thing that most people agreed on was that most multiple star systems would disrupt the protostellar disk so that planets would not be formed (or would so unstable they would be lost). Much to the disappointment of Starwars fans, Tatooine would not be possible. Now comes a report of a planet in a triple star system. This means we have to rethink the whole planetary formation idea again. Planets may be even more common than we thought, and Tatooine becomes possible again. There is a great quicktime animation of an artists conception of sunset as seen from a hypothetical moon of the gas giant in this system. Of course, photos are printed these days by a digital scanner scanning the negative and printing from the scanned image. The negative scanners can't cope with astronomical photos that don't have clear edges. So my photos from pristine skies will go undeveloped until I can get to the one remaining photoshop that still uses mechanical development (sighs). When one is packing for a camping trip, and has packed the digital camera and the SLR in anticipation of pouring rain pristine skies, here are a couple of handy hints. 1) Make sure you have a spare battery (or the recharger) for the digital camera, as despite having recharged the battery before leaving, it will run out before the trip is over (usually when the kids are at their cutest). 2) When packing the SLR, do check that there are more than three shots left on the roll, or make sure you have a spare film, otherwise just as you are ready to do your photomosaic of the heart of the galaxy the film will run out. 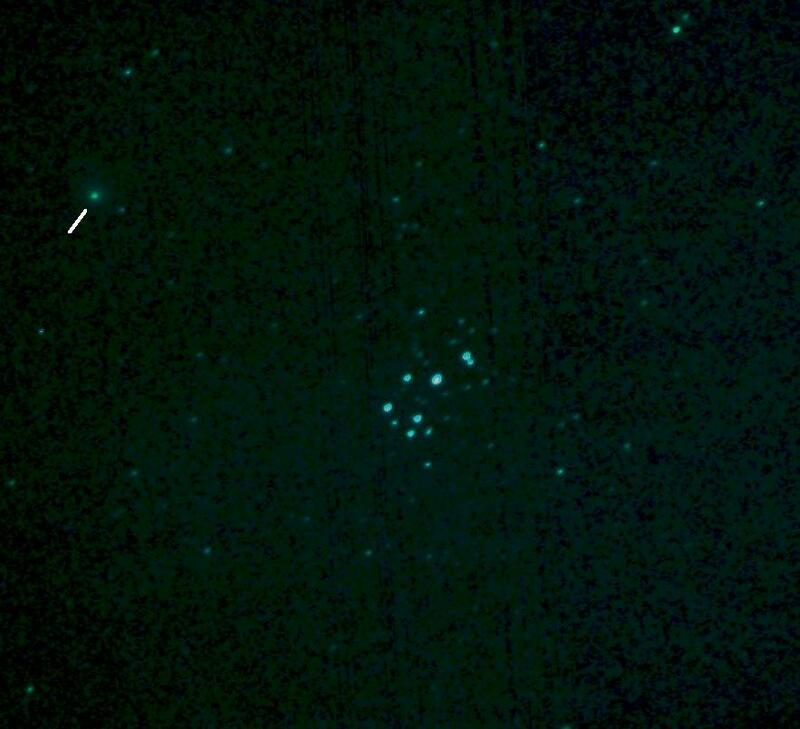 Well, the trip wasn't quite the astrophotography feast I was hoping it could be, but when I put my film in to be developed, it turned out that I had taken a large number of shots of comet Macholz near the Pleiades in January this year, and completely forgotten about them. The shots aren't so hot as suburban skyglow messed things up a bit, but still you can see Macholz (arrowed) glide past the stars of the Pleiades (the pictures were shot using a Pentax KM using cable release with a 10 second exposure using Kodak Max 400 ASA film, the scanned on a generic scanner and cropped in paintshop with 1.5 gamma correction). Of course my dark sky photos didn't get printed, because unlike the suburban ones, there is no sky glow, so it looks to the casual eye as if they are blank. A quick check revealed the Southern Cross, so I'm going to get them printed tomorrow. The trip was fun, and I'll write about it in instalments. Not too much astronomy due to the rain/fog/mist etc., but I'll work some astronomy into most of it (otherwise it will just turn into one of those nightmare sessions with Aunty Joan and her interninable photos of her trip to the Gold Coast/Torqay/Florida showing you 40 minutely different shots of herself at the Big Pineapple). Chez Reynella will head off camping this weekend. I've packed my 50 mm refractor and my cameras (I even bought a bigger memory chip for the Olympus in anticipation), therefore it will be completely cloudy. In the meantime, head off to the latest issue of New Scientist. They have a marvellous expose of the Intelligent Design Creationist movement, as well as nice (but short) articles on Titan and the Temple 1 encounter. New Scientist Space is also a nice destination. Just came from watching the news, and I am still a bit in shock. Up to 7 explosions hit London today, some in the Underground and 2 in buses. Reports from the BBC and the ABC are of two deaths and at least 90 injured. A group allied with Al Queda has claimed responsibility. We have friends in London and the UK, so far there has been no bad news from them. On behalf of all Australians, I'm sending our best wishes to the people of the UK. Sky was a bit darker tonight, and I got the 5mm Plossl out. Turbulence was terrible though. Could see stars down to 11.2 mag at least. I think I saw temple 1 with averted vision as a faint smudge. The comet list people now think that the total magnitude rise was fairly small, less than 1 magnitude unit, more like 0.5. John Bortle suggested that, given that the fairly large effect of the impactor produced a small increase in total magnitude, is it possible that when we do see comets increasing by 1-3 magnitudes, we are seeing something catastrophic? On a lighter note, the Astrologer who is suing NASA over Deep Impact "distorting her horoscope" is likely to have her case heard in late July. She is claiming $8.7 billion Roubles for "moral suffering". Pravda reports "Marina Bai clarified that when her grandfather met her grandmother, he showed her the comet in the sky, and it became the romantic start of their long family life." Now this I doubt, Temple 1 should have never been more than a fuzzy 6th magnitude dot in the sky. John Hawks Anthropology Weblog discusses a brain area in Maques that looks like the humans Broca area involved in speach (we already know there is a similar one in chimps). Over at The Loom, Carl Zimmer discuses mice with a mutant FOXP2 gene. Humans with mutant FOXP2 have trouble with speach. Mice with mutant FOXP2 have trouble squeaking. Over at New Scientist, reports that human foot prints in a layer of ash in America have been dated to 40,000 years is causing a stir. Also, it looks like we won't get a clear view of the impact crater, too much dust has been stired up. Over at Tom's Astroblog there is some great impact movies, including the shadow of the ejecta plume. On Stuarts Astronomy blog is some links to some more cool science results, Hubble images and the view from the Rosetta mission..
Just a brief note. Phil Platt and Tom's Astroblog discuss the science of the Temple 1 impact. The Deep Impact site has yet more images and videos. There are more fantastic images at the Hubble site. More stuff from gound based telescopes, a GIF movie of the impact (Images before the encounter were taken remotelly from Badlands Observatory, South Dakota, (26-inch with AP8)and after encounter from Ironwood Observatories, Hawaii, (C14 with FLI Dream Machine, via Vishnu Reddy). The ESO telescopic campaign has some nice info up, including a "how to make a crater" demonstration for kids. For us visual observers with small scopes, the brightening does not appear to be dramatic. Perhaps it might go up to magnitude 9, but maybe not. Buoyed by the reports of 9P/Temple 1 brightening by 2-3 magnitudes, which suggested it should be magnitude 9-8, I took myself and my telescope outside. Following my Skymap map, I star hopped from Spica to 76 Virginis (easy peasy). Then I started searching in between 76 and 82 Virginis for comet Temple. dim extended objects, but I'd say it was nowhere near magnitude 8, probably in the range of 10-11. Over on the comet observation list, Mike Linholt had reported it as having an m1 (that is coma magnitude) of 10.7, so no wonder I didn't see it. The comet listers think the increase in magnitude reports are for the much dimmer nucleus, which is being picked up by the big professional scopes. The coma intensity is much less likely to be dramatically affected. 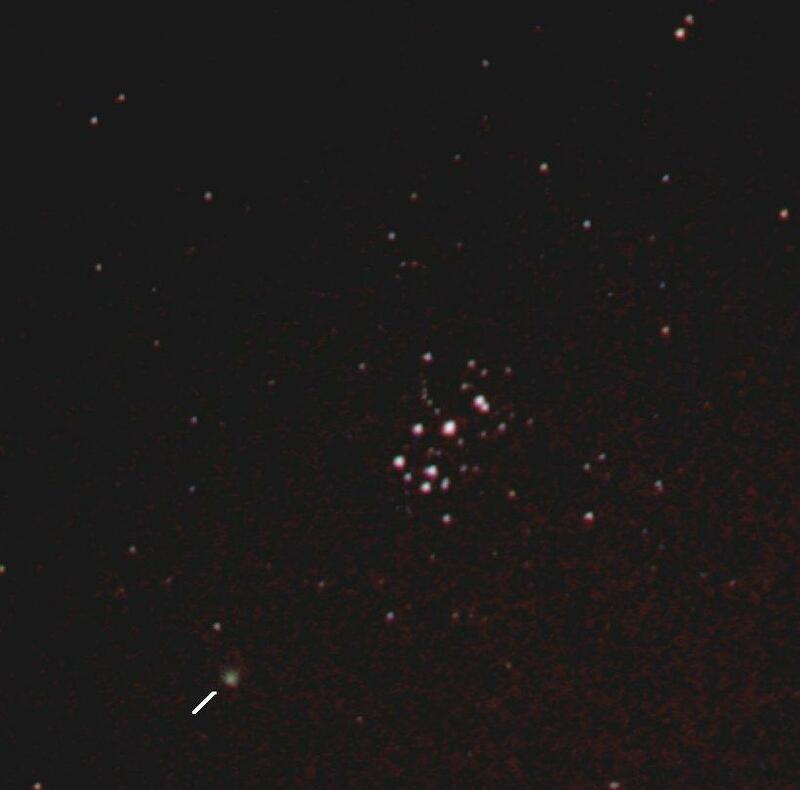 (News flash, Kearn Jones, also of Adelaide, reports an m1 of 10.3, I should have got the 5mm Plossl out, so the comet might have brightened by 1 magnitude unit). The evolution of the brightness of Temple 1 should be interesting over the next few hours. But the comet is too low for me, and I'm too tired, I'm off to bed. Some fantastic images are coming out of the Deep Impact mission. Pop over to the Deep Impact site itself for some of the latest mission images. These are raw images as well, when porcessed there will be a much better degree of detail. It's all a bit yahoo and laddish at the moment, but when everything is settled dow there will be some serious science happening. We will have the first spectra of the sub-crustal surface of a comet, and the most detailed close-ups. New Scientist Space and Spaceflight Now have some nice images. The Planetary Society has a great video of the approach and impact. Hubble got into the act as well. Ground based telescopes were not left out. Kitt peak has some nice before and after shots. Charles Sturts telescope web feed is running now, and there is an archive of shots to look at as well. 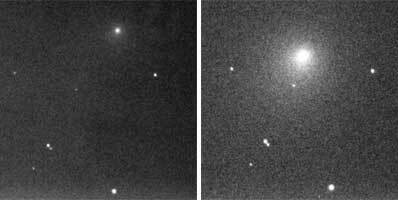 Reports are that the comet has increased in magnitude from 10 to between 8 and 7, well within the reach of small telescopes (as a fuzzy dot anyway). So I'm going out to look now. BANG! Right on Target! NASA TV came up again, and I got to see most of the impact live. Unfortunately most of the footage at the key time (and now) is cheering flight controllers, but they are replaying the impactor images, so you can see some great images of the impactor approach in between cheering flight controlers. Pop over to 2020 Hindsight for so live bloging and screenshots from NASA control. Kitt peak is frozen, NASA TV doesn't respond, (probably too much traffic) ESA TV has yet to broadcast, Manua Kea isn't showing anything. The Image Viewer at the Deep Impact site appears to be still updating, though it is just showing a furry dot. Deep Impact has released it's projectile, and around 3:50 pm AEST the projectile will collide with comet Temple 1. Further information is over at Bad Astronomy Blog, Tom's Astronomy Blog and Astronomy Blog (which directs you back here). Tom's Astronomy Blog has a better list of Web cams for the live impact than me. But I'll repost mine and pinch his formatting to make my list more readable. Kitt peak will be broadcasting image updates every 45 seconds for the hour before and after impact time. Mauna Kea will be broadcasting near-realtime images from its 11" Celstron instrument on the night of the impact. The Small Telescope Science program should have images from participants fairly soon after the event. In Australia the Charles Sturt University will be watching the skies with their remote telescope. The nibostratus turned to altostratus. The family wandered down to the beach to assist the local Coast Care (or was it Our Patch? I can never work out which program is involved) planting. The aim is to stabilise dunes and remove invasive species. Adelaide has a terrible record for keeping it's local vegettion, in the greater Adelaide area and Adelaide hills, only about 3% of the native vegetation remains. In the fragile dune system, our local city council has made a bikepath which is like a super highway. So revegetation work is a priority. Both myself and the Bettdeckererschnappender Weisle are biologists, and BW is an environmental manager. We've been volunteering for these sorts of projects for quite some time. BW used to work for TreeProject, an Victorian revegetation group. We have spent many a happy hour trying to get Hamilton tree planters to make an impression on rockhard soil, or sloging though glutinous mud. Planting and weeding in costal sanddunes is a joy after that. Not that I did much, my job was to keep Smallest One occupied so he wouldn't enthusiatically weed out the native plants we had just planted. So we pottered along the beach looking at sea grass and sea weed, digging holes with razor clam shells. Of course the clouds stayed. Didn't image Jupiter. this morning of course was clear as a bell, with the cresent Moon shining innocnetly well below the Pleaides.  As you can guess, the sky was clouded out, so no Pleiades occultation [SFX: tiny violin playing "Hearts & Flowers"]. There are some great Sun Spots, but I won't be imaging them either. Tom's Astroblog reports clear skies, and a neat way for CCD/Webcam users get your telescope into focus on screen (this is a perpetual nightmare for webcams that have significant time lag). Rather than change the name of this blog to "Obscured by clouds", [pauses, okay, I'm adding this to my blog description] I thought I might do an occasional series on clouds. After all, amateur astronomers spend a lot of time looking at clouds, and clouds are often very beautiful in themselves, even if they are obscuring a once-in-every-40-years phenomenon. The clouds last night and this morning were nimbostratus. Thick grey almost structureless cloud producing rain. They are probably the least attractive cloud around, and are the predominant cloud form here in Adelaide and Melbourne during the winter months. They are difficult to photograph, because of this structurelessness and lack of contrast. I can't think of much more to say about these clouds, next time I'll talk about more interesting cloud. Eldest one scored a goal today in his under-9's soccer match. This was his first goal ever, so I was a rather proud dad. Everyone is proud when their child does something for the first time, but Eldest one has had a harder time than average, he was born with a club foot. Club foot and born premature, the picture is Eldest one in his humidicrib shortly after birth. He had to have full length leg casts for a long time to try and correct his foot without surgery. Then surgery after all, then a succession of splints and casts. There are far worse things, ask the parents whose kids are in full hip casts for hip dyplasia. Once waiting in the clinic for yet another round of assessment, feeling sorry for ourselves, we asked the woman next to us what her son was in for. "Leukaemia" she said. You soon get a sense of perspective in a hospital waiting room. Eldest one scored his goal 3 weeks after the last round of splints came off. So his first goal is rather special. To keep this slightly astronomical, Eldest ones favorite planet is Saturn. When he was two, I took him out to see a partial eclipse of the Moon. The next night, whathing the Moon rise, he smiled and turned to me. "Daddies Moon", he said. For us Aussies, the meeting between the Deep Impact projectile and comet Temple 1 will occur during daylight (3:52 pm AEST). But there are a number of "live" webcasts of the encounter from Earth based telescopes. Kitt peak will be broadcasting image updates every 45 seconds for the hour before and after impact time. Mauna Kea will be broadcasting near-realtime images from its 11" Celstron instrument on the night of the impact. The Small Telescope Science program should have images from participants fairly soon after the event. There is also NASA TV. In Australia the Charles Sturt University will be watching the skies with their remote telescope. Currently its only on from 8 pm to 9 pm AEST, but it will wacth the whole might of the 4th. So if you are in daylight or clouded out, put a comfy pillow on your computer chair and watch the event on the web. All right, I couldn't resist and have done an overlay of the images of the last week. Click on the image for a larger photo. The images were gamma corrected and stacked in iPhoto plus 4 centered on Venus, then (because stacking dimmed Mercury and Saturn) Mercury and Saturn were brightness adjusted in Paintshop Pro 4 and labled. Pity I couldn't get the camera in the same position each shot, or the trees would have been better.